If you are the owner of a small business, or a financial manager in a company, it is important for you to be familiar with financial statements, and how they are prepared to get an idea of true profit or loss figures. 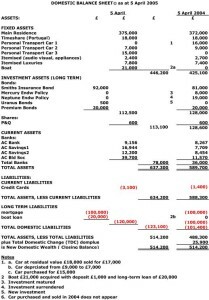 Income statement and balance sheet are two of these financial statements. These are two of the most important statements for a business as they provide an information about the yearly progress of a business and where it stands at a particular point in time. Both of these statements are prepared for different purposes, and to understand their purposes, let’s look at some of the basic differences between them. The income statement is also known as the profit and loss account as it tells the net figure of profit and loss, whereas, the new name of the balance sheet is a statement of financial position. If the income statement of a company shows good profits over a number of years, it indicates a healthy balance sheet. But having a healthy balance sheet does not necessarily means that a company will have a strong income statement as well. For example, it is possible that in a certain accounting period, a company may suffer loss, but the balance sheet position of a company may not be affected by that loss. The income statement is prepared for a specific accounting period, and the length of this period varies from one business to another. The yearly income statement contains financial information of an entire year, whereas, quarterly and half yearly statement covers a period of three months and six months respectively. The time period is clearly mentioned at a beginning of the statement. On the other hand, balance sheet provides a progress report on the financial position of a company at a specific point in time. The balance sheet is always dated till a certain period, and values of elements on that date are accurate as of that particular period. All the incomes and expenses over a certain period of time are incorporated in an income statement of a business. Revenue is credited and expenses are debited on a statement. Balance sheet, on the other hand, provides an overall summary of business finances. Three items are reported on a balance sheet including owner’s equity or capital, assets and liabilities. Assets depict the ownership of a company, liabilities include short as well as long term obligations of a business, and owner’s equity is a value of equity provided by a shareholder to meet the financial requirements. The basic purpose of preparing an income statement is to identify how much profit a company has generated or loss it has suffered from its business activities. Income and expenses are divided into different categories, which makes it easier to identify the source of profit and loss. The balance sheet is also called statement of financial position, as its purpose is to provide an overall picture of where a business stand financially. When it comes to calculation of different values, income statement just needs a single set of calculations. All you need to do is to sum up all the revenues and sum up all the expenses, and then subtract total expenses from total revenue to get a profit or loss of a business. To calculate owner’s equity on balance sheet, a few calculations are required to be performed. For example, liability of a business is required to be deducted from its assets in order to get the owner’s equity, and the asset must always be equal to shareholder’s equity and liabilities. It ensures that the balance sheet has been accurately maintained. Hira Waqar. "Difference Between Income Statement and Balance Sheet." DifferenceBetween.net. May 29, 2015 < http://www.differencebetween.net/business/accounting-business/difference-between-income-statement-and-balance-sheet/ >.